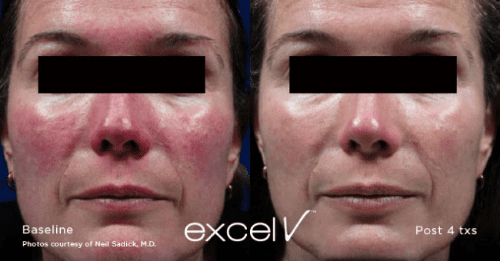 excel V™ and Laser Genesis utilize the latest laser technology to improve the appearance of fine lines and wrinkles, diminish facial redness and brown spots, and even eliminate the appearance of veins on your face and body. Say hello to a glowing, camera-ready complexion. *At this time, this service is only available at our Grand Forks office. 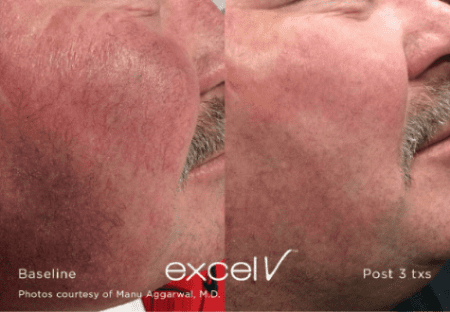 excel V™ is an advanced aesthetic technology that combines two powerfully precise lasers to target and eliminate vascular concerns such as redness and veins, as well as age spots, sun spots, and discoloration on the face and body. It treats nearly twenty different skin concerns, including rosacea, unsightly veins, brown spots, and acne scars, with results showing in just a few days. 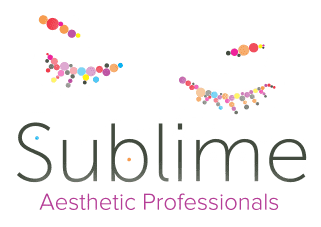 Laser Genesis is a breakthrough laser treatment that stimulates the skin’s natural processes to reverse the signs of aging and sun damage, revealing a vibrant, healthy-looking complexion. This treatment helps restore your skin’s youthful glow and an appearance by improving common concerns such as facial redness, brown spots, fine lines, and wrinkles. 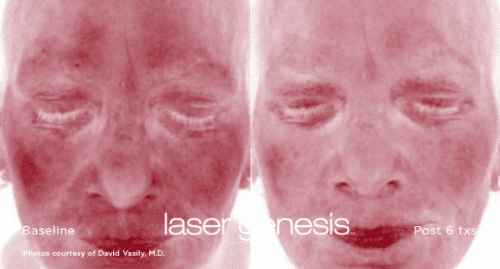 With quick treatments and no downtime, it’s easy to fit Laser Genesis into a busy schedule. The number of treatments for excel V™ will vary depending on your condition, but most treatments require only one to two sessions. Laser Genesis typically involves four to six treatments, with ongoing maintenance treatments to sustain the results over time. excel V™ / Laser Genesis usually only takes five to ten minutes, with some sessions lasting up to 45 minutes. excel V treatments can feel similar to a rubber band snapping against the skin. Depending on the procedure, a cooled treatment tip will be in contact with the skin to protect and provide comfort. With Laser Genesis, you will feel a gentle warming of your skin’s surface during the procedure. Patients often describe the treatment as relaxing and therapeutic. Redness and/or swelling can be expected and will resolve itself in a few days. Typically you can wear makeup and return to normal activities immediately.